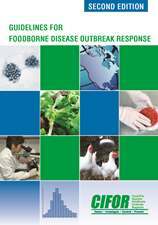 The second edition of the Council to Improve Foodborne Outbreak Response’s (CIFOR’s) Guidelines for Foodborne Disease Outbreak Response describes CIFOR’s overall approach to foodborne disease outbreaks, including preparation, detection, investigation, control, and follow-up. The guidelines incorporate many significant changes that have occurred in the foodborne disease surveillance and outbreak investigation framework since the first edition of the Guidelines was published in 2009. The second edition includes information about the Food Safety Modernization Act; new information about model practices in outbreak investigation and response; updated statistics, references, and examples; and enhanced alignment between the guidelines and the CIFOR toolkit.